Note: MMPND (Multilingual Multiscript Plant Name Database) separates common names for Myrciaria cauliflora and Myrciaria jaboticaba based on "fruit color." Plant List lists the two as synonyms of the same species. FRENCH: Jaboticaba de Sao Paulo. 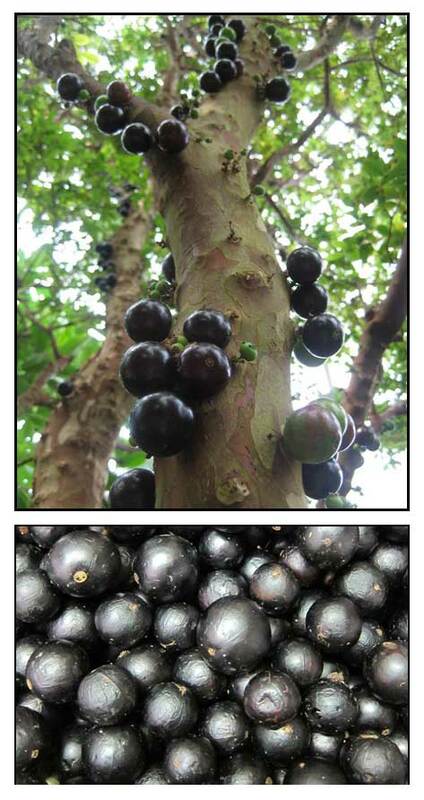 PORTUGUESE: Jaboticaba, Jabuticaba, Jabuticaba-acu, Jabuticaba-de-sabara, Jabuticaba grande. SPANISH: Guapuru, Iba-puru, Jaboticaba, Yabuticaba. - Cauliflora is from cauliflorous, meaning the fruit and flowers grow directly on the bark or underbark along the trunk, limbs, and branches. - Native to the Brazil. - Caution: Regular high and prolonged consumption of the skin should be avoided because of high tannin content. Tannin is antinutrient and carcinogenic if intake is frequent over a long period of time. - Studies have shown hypotensive, vasorelaxant, antifungal, antibacterial, hypolipidemic, blood glucose lowering, antiproliferative, antioxidant, nephroprotective properties. - Dye: Extracts used as natural dye in food coloring. Sorting Myrciaria names / /Maintained by: Michel H. Porcher / MULTILINGUAL MULTISCRIPT PLANT NAME DATABASE / Copyright © 1995 - 2020 / A Work in Progress. School of Agriculture and Food Systems. Faculty of Land & Food Resources. The University of Melbourne. Australia. Jaboticabas--Myrciaria cauliflora Berg. / Morton, J. 1987. Jaboticabas. p. 371–374. In: Fruits of warm climates. Julia F. Morton, Miami, FL. Myrciaria cauliflora extracts attenuating hyperlipidemia and obesity in vivo / Hui-Pei Huang / International Journal of Contemporary Research and Review (2017) Vol 8 No 7. Toxicity of the phenolic extract from jabuticabeira (Myrciaria cauliflora (Mart.) O. Berg) fruit skins on Spodoptera frugiperda / Ana Paula Alves, Angelita Correa, Dejane Alves, Adelir Saczl. Jessica Lino, and Geraldo Carvalho / Chilean Journal of Agricultural Research, Santiago de Chile, Vol 74, No 2: pp 200-204, Apr. 2014.